on boxes or supplies and packaging materials ($75 minimum). For your convenience, Men on the Move carries an assortment of boxes and moving supplies to help you protect all your valuable possessions. 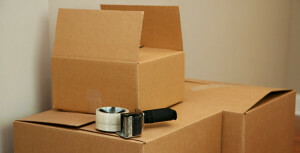 Our moving boxes can help you protect your most prized possessions. Everything from books and clothes to dishes, mirrors and lamps. We’ll help make sure everything gets where it’s going in one piece. We carry all of the essentials: boxes, packing paper, bubble wrap, paper pads, and more. All reasonably priced. Supplies are available at our Westland or Ann Arbor, Michigan locations. $1.50 Handles items like books and records. $2.25 Ideal for shoes, purses, pots and pans, kitchen utensils, foods, toys, linens, blankets etc. $2.75 Great for lampshades, bulky blankets and towels. $3.50 Good for drapes, bedspreads & awkward items like dollhouses and small furniture pieces. $5.50 Double wall thickness for dishes, china & glassware. $12.00 Hangar bar lets you move clothes without removing hangars. Also good for hangings plants and swag lamps. $4.00 Ideal for any lamp up to 40″ tall. $7.00 Heavy duty clear poly bags in twin, full, queen & king sizes protect your mattress and box springs. $12.00 10 lbs. of white newsprint. $20.00 24″x50′ Ideal for parties, painting and remodeling, moving, RV’s and boats. We also carry: Bubble wrap, tape guns and paper pads. Free Delivery of boxes or supplies and packaging materials with $75.00 minimum. Contact us today for more information on all moving supplies. Read More By Kathy M.